EnergyScanIR™ is a 3-day intense training course. The course curriculum includes classroom study, marketing/business coaching and hands-on training for conducting the infrared survey in residential and commerical buildings. The course materials have been developed over many years of field experience and include the complete business solution, including how to market, sell & grow an infrared business. Bring your IR camera to class. Some cameras will be available for student use but are not guaranteed. A laptop with Microsoft Word 2007 (at a minimum) is required. Training is delivered by United Infrared, THE industry leaders in infrared thermography. Why sign up with us? 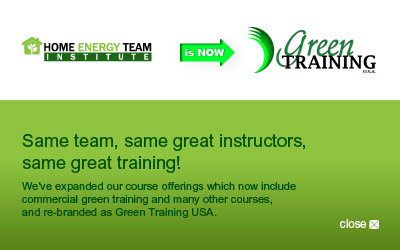 When you sign up though Green Training USA, you get a complimentary 6-month membership in United Infrared INCLUDED ($300 VALUE. Reg. $600/year) - and membership is REQUIRED to take this course. Includes many valuable membership benefits (see below for details).